This world-famous destination attracts millions each year, but no one knows the canyon better than Pink® Adventure Tours. Our local guides live and work at the canyon. 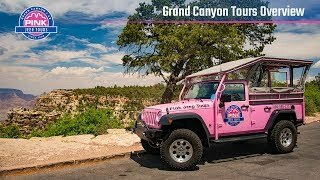 That means they offer unique insight into every nook and cranny, which they’ll share as you explore the canyon in open-air Pink® Jeep® Wranglers. The South Rim offers a wealth of discoveries with more than 100 years of heritage, including Hermits Rest and the historic Grand Canyon Village—all while learning about the park’s legendary history. If you’re feeling adventurous, hike trails that wind below the canyon’s rim. A larger-than-life locale deserves a screen to match. Stop in and see “Grand Canyon: The Hidden Secrets,” which explores humanity’s relationship with this natural wonder. This is where your tour really gets started. Please arrive at least 15 minutes before your departure time to meet your guide and get helpful tips before jumping into your Jeep. Reserve a tour, check in for your adventure or go over final details before you hit the road. After your trek, browse our gift shop and ask our team about the area’s best eats, activities and stays.